Theresa Williamson ’97 Shares Grassroots Solutions to Civic and Social Problems. Theresa Williamson in Santa Marta, a Rio de Janeiro favela. While Theresa Williamson studied biological anthropology at Swarthmore, the Internet exploded into her world—and ours. When she was a freshman, people were still using Gopher to connect computer-to-computer over the fledgling World Wide Web. Netscape, released in 1994, revolutionized Web browsing. Users of the Web jumped from 16 million in 1995 to nearly 150 million by 1998—the year Google was launched. And although the term “social networking” lay in the future (Facebook started in 2004), Williamson quickly saw the potential of the Web to build community and drive social change. By 2000, she had started Catalytic Communities, one of the first online initiatives to share solutions to civic and social problems. 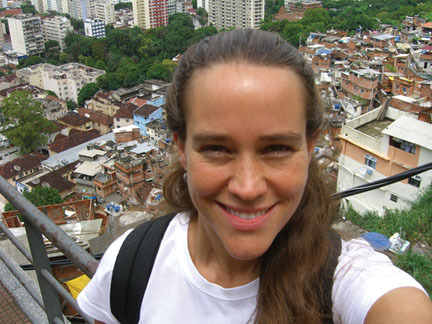 Based in Rio de Janeiro, where Williamson had lived as a girl with her Brazilian mother and British-born father, CatComm.org concentrated first on connecting community leaders in the sprawling city’s 600-plus favelas, or squatter communities. This year, CatComm celebrates its 10th anniversary. One challenge was to provide access to computers in communities where Internet penetration was very low. In 2003, CatComm opened the Casa do Gestor Catalisador (Casa Community Technology Hub) where computers with Internet access attracted more than 1,000 community leaders from Brazil and around the world during the next five years. Services included helping them open e-mail accounts, write project proposals, participate in workshops, and make use of Internet resources. It quickly became apparent that the civic challenges in Brazil—sanitation, crime, homelessness, water quality, health, environment, etc.— were almost identical to problems encountered all over the world. And grassroots solutions, which often seemed to work better than many top-down government or NGO programs, could and should be shared globally. To this end, CatComm created a Community Solutions Database (CSD) to gather and link innovative responses to civic and social issues around the world. A group of volunteer translators made sure that all of these postings were available simultaneously in English, Spanish, and Portuguese. One solution described on the CatComm website involved training young women in order to break the cycle of social and economic exclusion. Using materials collected in and around their homes, participants learned to transform trash into art, which in turn could be used to generate income. Some of the services offered by the project include psychological counseling, STD/AIDS counseling and workshops, and job referrals. To date, the CitizenArt Project has served nearly 200 women. And although CatComm was among the first to post a lot of community solutions online, similar databases have been springing up all over the world. One site, WiserEarth, the brainchild of San Francisco environmentalist Paul Hawken, author of Blessed and Blessed Unrest, aimed to link ideas, resources, and activists from all sorts of movements—from community development to women’s issues to global warming—in one clearinghouse for change. CatComm decided in 2009 to join forces with WiserEarth, contributing its collection of more than 250 community-based solutions from 21 countries to the WiserEarth project while still maintaining its own identity. Thinking global doesn’t mean Williamson isn’t still acting local. Rio de Janeiro will host the 2016 Summer Olympics, and a lot of community leaders are concerned that residents of the favelas will be left out of the planning—even forced out of their homes—as the city readies for the games. They’re already talking about it on CatComm.org.